Using a pancake mix is one of the easiest ways create onion rings with a puffy, slightly crisp coating. Pancake mixes are convenient because they already come with baking soda, baking powder, sugar and a dash of salt mixed into flour. You only need to add water to create a thick batter. 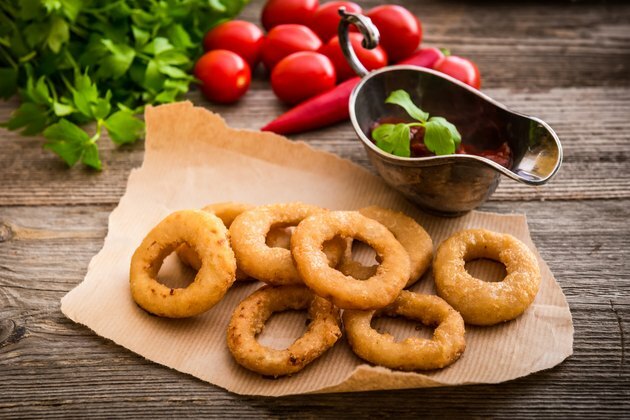 Serve the onion rings with a ketchup, barbecue sauce or a spicy mayonnaise-based dipping sauce. Peel off the outer layer of large onion and lay it on its side on a clean cutting board. Trim off the stem end of the onion with a sharp chef's knife. Slice the onion, working backwards from the stem end, into evenly-spaced slices. You can make the slices as thick or thin as you prefer. Separate the slices into individual rings. Heat vegetable oil in a large, deep skillet so that it reaches about halfway up the sides. Bring it to medium-high heat, or about 370 to 375 degrees Fahrenheit. Use a candy thermometer to get an accurate read of the oil temperature. Combine pancake mix and water in a large bowl, using about 1 1/2 to 2 cups of water for every 2 cups of pancake mix to create a thick batter. Add more pancake mix if it seems too thin, or more water if it's overly thick. Season lightly with salt, pepper and other herbs and spices to your taste. Dredge each onion ring into the batter, then carefully into the hot oil. Work in batches to avoid overcrowding. Fry the onion rings for about 2 to 4 minutes, turning them over halfway through, until both sides are golden brown. Drain the rings on a paper towel-lined plate and serve hot. Sweet large onions such as Vidalias and Maui onions are ideal for onion rings, adding a strong, sweet contrast to a savory seasoned pancake batter. For crunchier onion rings, roll them in panko breadcrumbs after dipping them in the pancake mix batter. For beer-battered onion rings, combine the pancake mix with beer instead of water when making the batter.